On Friday, September 28, an open house for the Campus Center at Watts Hall was held, with offices and hallways open to the campus community including alumni and parents attending Homecoming and Family Fall Fest. The event highlighted the co-location of many administrative offices, which is more convenient for students and also an effective means by which to increase collaboration and camaraderie among staff members. President Ron Chesbrough shared some remarks about the successful, well-received consolidation with the crowd and a cake cutting marked the official opening of the renovated facility. Cazenovia College held its 17th Annual Wheler Family Conference on World Affairs on Conflict and Resolution. During the seven morning breakout panels, panelists shared how they have handled conflict and resolution in their careers. The afternoon session of the conference featured plenary speaker Emma Voigt '12. Voigt discuss the role of fashion in conflict. The Dean’s List is a distinction given to students who earn a grade point average of 3.5 or higher. At this year’s reception, more than 200 students were recognized. The New York Tau chapter of Alpha Chi inducted 15 of Cazenovia’s top-performing students. This year’s inductees have compiled a Cazenovia College (New York Tau chapter Alpha Chi) record for combined GPA of 3.95. The Cazenovia College chapter of Alpha Lambda Delta (ALD), the National Honor Society for First-Year Success, proudly inducted a new group of students on Saturday, September 29. ALD invites all first-year students who have earned a 3.5 grade point average achieved during either the first term of their freshman year or for the first year overall. Thanks to the wonderful achievements of Cazenovia College students, the College’s student Merit pages continue to grow. 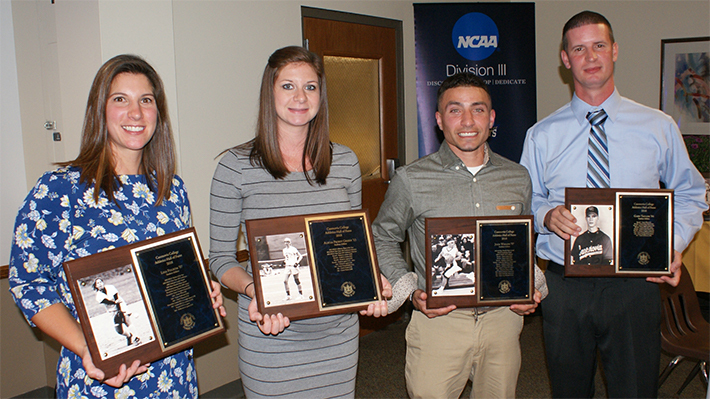 Cazenovia alumni Lisa Folsom '07, Alicia Priest Green '13, Josh Winans '07, and Gary Taylor '04 became the newest members of the Athletics Hall of Fame on Saturday, September 29, at the annual Blue & Gold Dinner & Hall of Fame Induction Ceremony. Learn more about Dominique Metoyer, a Cazenovia College senior from Queen Creek, AZ, majoring in Psychology. On October 3, 2018, Cazenovia College held its 17th Annual Wheler Family Conference on World Affairs on Conflict and Resolution. During the morning panel discussions, our panelists shared how they have handled conflict and resolution in their careers. Learn key takeaways from each of the panelists, as well as what they learned from the students.